this dish is as healthful as it is delicious. Butternut squash enchiladas is the perfect combination of flavor and healthy ingredients! 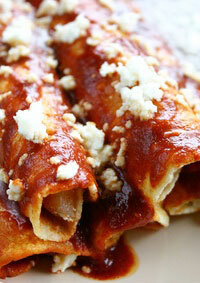 These enchiladas just scream with delicious flavor - the butternut squash, the sauce, the "cheese". It makes for a very tasty entré! Place squash in medium saucepan. Add water. Cover pot tightly and place over medium-high heat. Cook until squash is tender but not mushy, 12-15 minutes, depending on size of cubes. Drain squash and set aside. While squash is cooking, in large skillet, heat oil over medium-high heat. Add onion and sauté until soft and translucent, about 4-5 minutes, stirring occasionally. Add beans and partially mash with fork. Mix in squash, cumin and cinnamon. Add salt and pepper, if desired. Remove from heat and set aside. Preheat oven to 350 degrees. In 9" by 13" baking dish, lightly coat interior with cooking spray and set aside. Coat tortilla on both sides with cooking spray. Lay on plate. Spoon 1/2 cup filling on tortilla and top with 1½ tablespoons cheese. Roll up filled tortilla and set at one end of baking dish. Repeat, placing filled tortillas side by side, filling baking dish tightly. Pour salsa over assembled enchiladas. Sprinkle remaining cheese (about 1/4 cup) over sauce. Cover pan with foil. Bake enchiladas about 25-30 minutes, until heated through. Uncover and serve garnished with cilantro, accompanied by cooked brown rice, if desired. Per serving: 260 calories, 6g total fat (1g saturated fat), 38g carbohydrates, 12g protein, 6g dietary fiber, 460mg sodium.